Tridecyl b-D-maltopyranoside is a disaccharide derivative and glycoside which is applied as a non-ionic detergent and surfactant. In studies on membrane protein crystallization, Tridecyl b-D-maltopyranoside proved to be an effective detergent for maintaining protein solubility but necessitates the presence of salt. 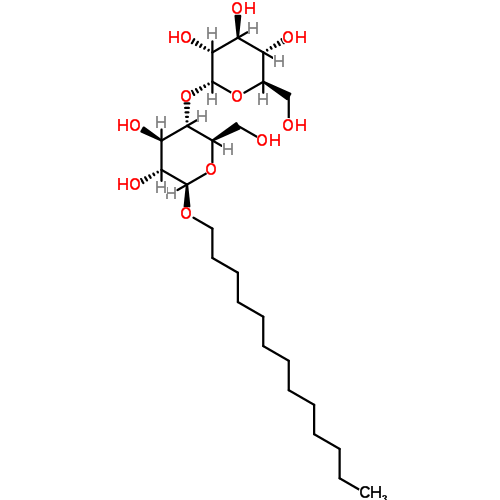 Tridecyl b-D-maltopyranoside has a longer chain length than Decyl β-D-maltopyranoside, another detergent used on membrane protein crystallization. Decyl β-D-maltopyranoside has been used in micellar electrokinetic chromatography to study enantiomer separation of drugs.